There would be no 5am starts for the Pirates women’s flag team on this Opal Series game day. For the first time, the Pirates would host an Opal round. 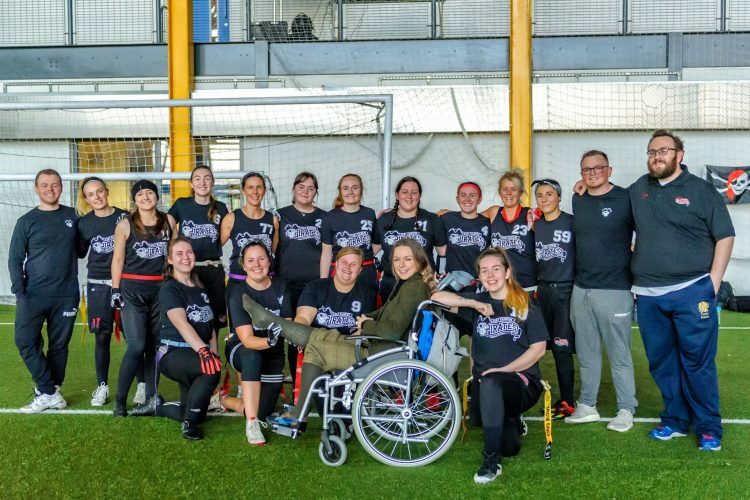 The Chorley Buccaneers, Sheffield Giants and Manchester Titans travelled north and within the indoor arena at Ravenscraig Sports Centre, the four sides would battle it out for playoff seeding. Despite not having the disadvantages of long travel and an early rise, there would be some new pressures to deal with for the Pirates. They would be playing in front of an expectant home crowd for the first time and there was also the small matters of claiming the #1 seed in the North and finishing the regular season unbeaten. A rousing rendition of Scotland the Brave played by Paige Cawley on the bagpipes got the blood pumping. Would the ladies complete the job? Game 1 was against the Chorley Buccaneers. During last season’s Opal campaign, the Pirates offense struggled at times against the rare no-blitz defense of Chorley. However, this season it was a different story. The first clash in Sheffield finished 46-0 to the Pirates and the second meeting followed a similar story. The Pirates defense stifled Chorley once again, stopping them from reaching the endzone all game. Four interceptions combined from Carla Costa (with two), Aynsley Barclay and Robyn McCluskey, coupled with the usual solid tackling of the entire defense, held Chorley within their own half for the majority of the contest. Robyn stood out by racking up a huge 11 tackles by herself. When the Sheffield Giants and East Kilbride Pirates face off, the games never disappoint. This one was no different. Both teams were the early season picks to claim superiority in the North and that played out as expected. The first contest in Sheffield was a huge win for the Pirates (31-19) and handed them the advantage going into the return fixture. EK knew the Giants would be gunning for revenge and perhaps the nerves got the better of the Pirates in the early going. Some uncharacteristic over-throws, drops and fumbles on offense led to a whimpering first drive from EK. Sheffield showed their class and GB Gold-level experience on their first possession calmly driving down the field to take the lead, 0-6. The second Pirates drive looked to be following the same pattern as the first. 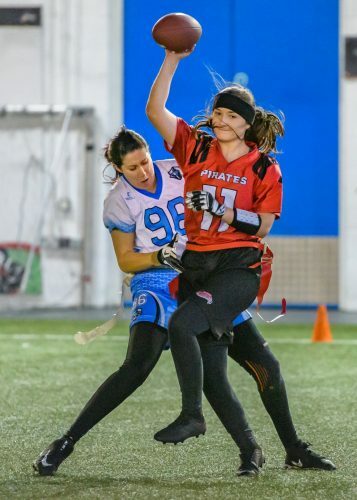 However, a contact penalty on the defence gave the Pirates a new set of downs and they took full advantage with Clare Dynes catching the score at the front of the endzone, 7-6. The game was in a fine balance at this stage. However, Robyn McCluskey broke the game wide open by out-foxing the Giants QB to step in front of a pass before running in for the pick 6 and sending the Pirates sideline into hysterics, 13-6. Momentum looked to have swung in the home team’s favour. However, the Giants weren’t backing down from the fight. They grabbed another score of their own before the Pirates answered back with an Aynsley to Louise touchdown to keep in front. An interception before the half from Carla Costa, gave the Pirates a slim 20-13 lead at the break. If the first half highlighted the offenses of both teams, the second half advertised the defenses. Both teams struggled to move the ball as the tough tackling and excellent coverage of both sides took over. In particular, the blitzers from both sides caused havoc in the second half. Pirates blitzers Rebecca Gibson and Rhiannon Innes, making her debut, caused problems for the opposing QB giving her little time to settle in the pocket. The Giants were the first to score in the second half as they tied the game at 20-20. The Pirates answered after an offensive adjustment from the sidelines resulted in Aynsley finding Louise wide open in the Giants secondary for a massive score to retake a 26-20 lead. Now it would be on the Pirates defense to seal the victory. Sheffield received the ball back with 1:14 left in the game. Two quick sideline completions moved the Giants towards midfield. 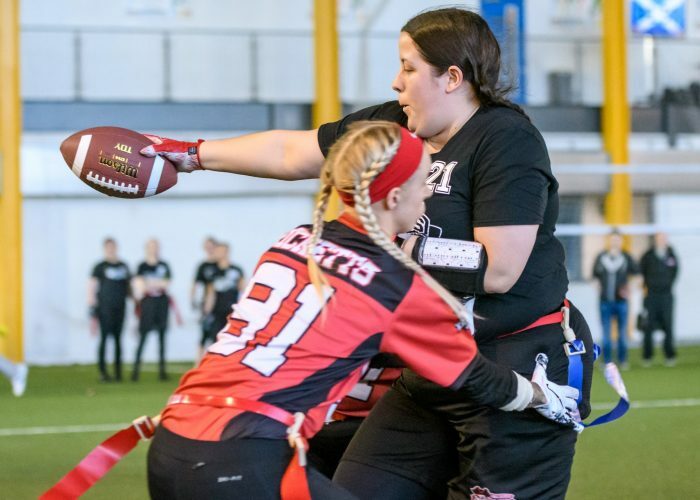 However, on 3rd down, rookie Rhiannon Innes came up with one of the plays of the game, sacking the QB to put the Giants in a 4th and long situation with the clock running down. The Giants pulled out a trick play in a Hail Mary attempt, got the pass downfield but the Pirates safeties were lying in wait to bat the ball away from the Giants WR. Victory formation to finish as the Pirates kneeled the ball to end a thrilling, topsy-turvy game (available to watch via the East Kilbride Pirates Facebook page). A true team victory with both sides of the ball earning the win. For the first time, the Pirates swept the Giants and claimed the #1 seed from the Northern Opal conference. Queens of the North! The Pirates could have been forgiven for perhaps coming out flat in the final game against the Manchester Titans after what went on before. However, this was not the case as the ladies delivered another professional performance. Plenty of rotation on both offense and defense had all of the squad involved throughout. Aynsley added another 7 touchdown passes to her tally, with Stacey Johnston catching two. 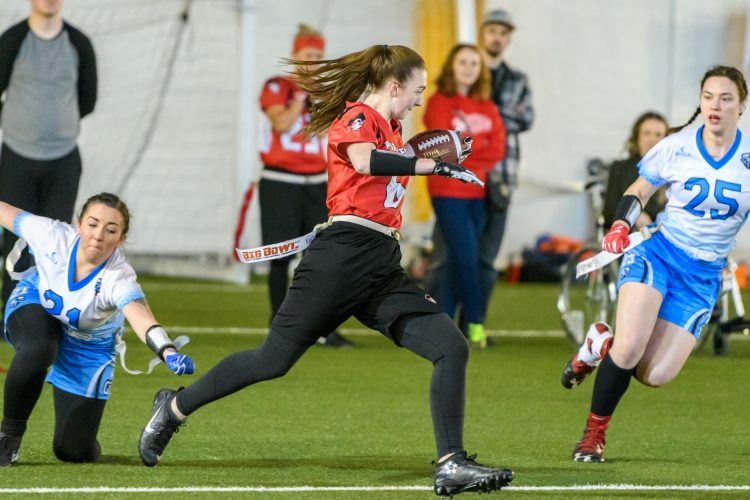 There was also a first touchdown for rookie Rhiannon Innes. Saskia Köttler ran in a score while making two defenders miss the tackle attempt. On defence, safety Carla Costa had another day, going for three picks before switching over to offense to catch a score. WR Paige Cawley switched in place of Carla on defense and came up with an interception of her own. The strength in depth of this Pirates roster was highlighted throughout this contest. Final score, EKPW 52 – 19 Titans. On a bad note, the Titans suffered two injuries during the day, including one to former Pirate, Julie Gilmour. We send our best wishes to both players. 14-0. Undefeated in the regular season. A fantastic achievement for EKPW flag. However, not something the team will rest upon as the job is not over yet. Next Saturday, November 24, the Pirates will once again make their way to Sheffield for Opal Series finals day. Entering as the #1 seed for the first time, the #4 seed from the south awaits: Coventry Cougars Youth. A stern test indeed but one the Pirates are ready for. Coverage and updates from finals day can be followed via the Facebook page. Finally, a thank you to those who helped the first Opal date in Scotland run smoothly. 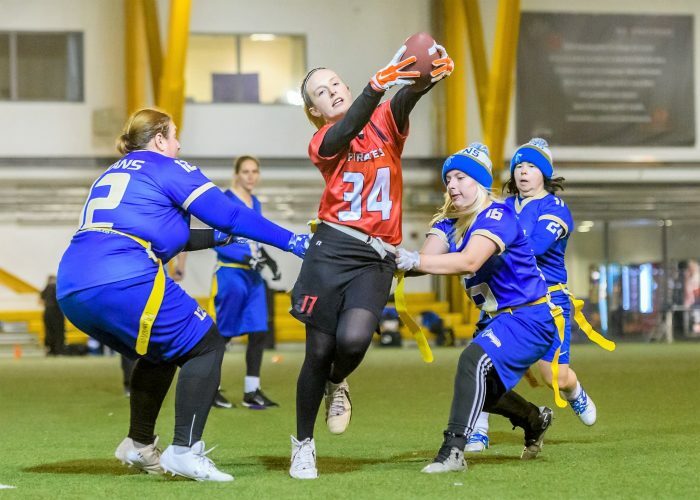 Representatives from the Glasgow Hornets and Killer Bees, Carnegie Flag, Grangemouth Colts, Edinburgh Outlaws and Aberdeen Oilcats all volunteered to help out and highlight the strong community within the flag football scene in Scotland. Also to the extended Pirates family who came along to support and cheer on the team. Thank you all.